So much for trans­paren­cy. Nei­ther Exxon nor Pub­lic Inter­est Watch would share a podi­um with Green­peace USA chief Trou­ble­mak­er John Pas­sacan­tan­do and the Wall Street Jour­nal reporter who broke the sto­ry on the IRS audit­ing Green­peace at the behest of PIW, an Exxon front group. There’s a tran­script here from Democ­ra­cy now of the dis­cus­sion. Why is it scary is that Exxon isn’t account­able for any of this? Because fun fact num­ber 123, kids: Exxon’s prof­its last year were big­ger than the annu­al bud­gets of 123 coun­tries. Coun­tries are, in the­o­ry, account­able for their dirty tricks. Fat cat cor­po­rates like Exxon can sim­ply buy the demo­c­ra­t­ic process. They’re not even account­able in the mar­ket­place. As Karma­ban­que points out, their retail sales form such a tiny frac­tion of their income that we the peo­ple can boy­cott them to our heart’s con­tent, and it won’t real­ly dent a toe­nail on the T-rex. Exxon­se­crets keeps track of who Exxon pays to deny cli­mate change and glob­al warm­ing. Per­son­al­ly, I think there ought to be a “Cor­po­rate Crimes Court.” We can already count deaths attibutable to glob­al warm­ing, and that num­ber is going to soar in com­ing years. 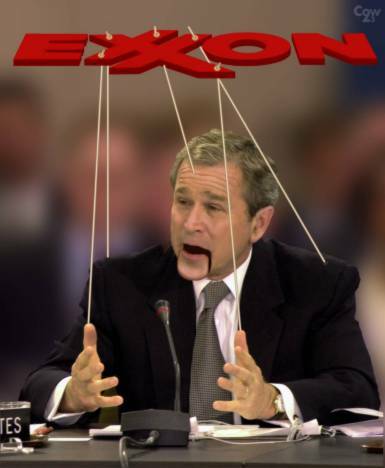 There are indi­vid­u­als behind the poli­cies Exxon, and they deserve to be behind bars just as much as any war crim­i­nal. Dai­lyKos pal Plu­to­ni­um Page wrote a great blog on the WSJ sto­ry when it broke. Hi Bri­an — thanks for the great post, and point­ing to the Democ­ra­cy Now tran­script. I’m also not sur­prised that Pub­lic Inter­est Watch is remain­ing silent and won’t talk now that they’ve been exposed. What a bunch of wimps, eh? Typ­i­cal. Steve Steck­low gave a good inter­view, I think. The WSJ occa­sion­al­ly comes up with left-of-cen­ter stuff, and this was a fine exam­ple of how they can actu­al­ly do a good job with it. I real­ly won­der where their oth­er fund­ing came from? How do you find that out? Hmm, do you think PIW got some $$$ from Big Phar­ma? Previous Previous post: Iran: it will be war.